Ukrainian President Petro Poroshenko ordered his foreign ministry to react officially after reports that Grad rockets were fired at Ukrainian forces in Luhansk region, from over the border near the Russian village of Gukovo. Russian President Vladimir Putin has denounced a new round of US sanctions against his country, saying they will damage relations and hurt businesses from both countries. He said the sanctions were driving bilateral relations towards a "dead end". As shares in Russian interests hit by the sanctions fell sharply, markets also fell by more than 2.5%. 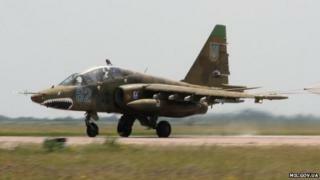 Mr Lysenko said the Su-25 had been hit at about 19:00 (16:00 GMT). Its pilot managed to eject and was rescued by Ukrainian forces, he said. It was "yet another act of provocation... carried out by Russia", Ukrainian newspaper Ukrayinska Pravda quoted him as saying. Ukraine's defence ministry said: "It is likely that [the hit] was carried out by air-to-air rockets from the Russian air force which were patrolling the border in a pair." It added that a second jet had been hit by a portable surface-to-air missile, but that pilot was also unscathed and managed to land his plane safely, AP news agency reported. Amateur video posted on Wednesday is said to show a plane being hit over Ukraine's eastern region of Luhansk. A Russian spokesman said Ukraine's claims were "absurd, just like all the previous accusations from Kiev's leadership against Russia's defence ministry", RIA news agency reported. Rebel commander Igor "Strelkov" Girkin said two Su-25 planes had been downed during fighting at the Marinivka border crossing. If Russia has indeed shot down a Ukrainian fighter jet over Ukrainian territory, it would be a significant escalation of this conflict, showing the Russian military openly engaging Kiev's forces. It will be made all the worse if Russia has fired Grad rockets at Ukrainian troops - or allowed the separatists to fire them from Russian territory. But grabbing territory without bloodshed as happened in Crimea and supporting a rebellion as has happened in eastern Ukraine are - diplomatically at least - very different to shooting down jets and raining rockets on the heads of soldiers in their own country. Mr Poroshenko issued his instructions after reports, backed up by amateur videos, that Grad multiple rocket launchers were fired from Russian soil in the direction of Ukraine on Wednesday. The Ukrainian government also accused Russia of shooting down an An-26 transport plane over eastern Ukraine on Monday, with the loss or reported capture of its crew members. Ukrainian officials sought to argue that pro-Russian separatist rebels could not have downed the plane because they lacked missiles to hit it at high altitude. Nato says that Russian troop numbers on the border have increased again to about 12,000. Russia is widely accused of orchestrating the separatist insurgency in Ukraine's eastern provinces by providing fighters and equipment. Russia denies this. Denis Pushilin, a rebel leader in the eastern city of Donetsk, told AP news agency: "Most of [our weapons] are trophies that we take from the enemy." "We cannot say that anyone is supplying us with weapons, even though we would like them to - not because we want to keep the conflict going, but because we need to protect civilians more effectively." In a separate development, European football governing body Uefa said it would not allow Russian and Ukrainian club teams to play each other "until further notice" in European competitions after football associations from both sides "expressed concerns about safety and security".